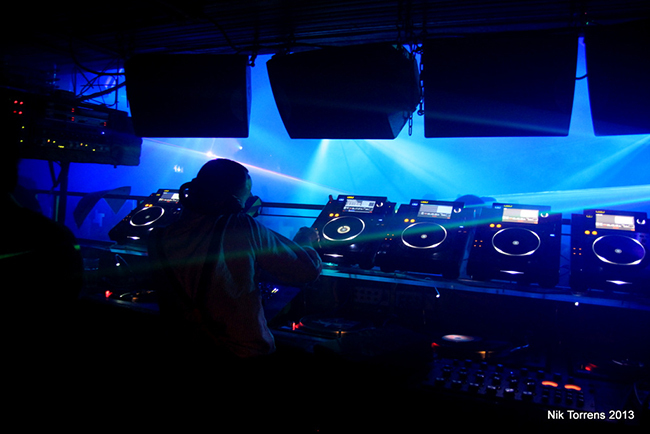 I had the honor and privilege to attend one of London’s most exclusive parties, the 14th Birthday Party of Fabric. Not only was I lucky enough to be in London at the time, but also I was grateful to attend this colossal party with so many amazing DJs from all around the world. After recently returning from Berlin, it was great to see many awesome Berlin DJs at the Fabric party. Marcel Dettmann, Tama Sumo, and Cosmin TRG were a few big names on the lineup. I was super excited for this party and to finally dance the night away at Fabric, which is rated for being one of the best clubs in the world. As I entered the club, I was one of thousands of excited kids ready to dance the night away. The first DJ I saw was London’s own Fabric resident named Terry Francis. He pumped the crowd up which started the evening out nicely. As an avid electronic music fanatic and world traveler I came to Fabric alone. The crowd was great and quite welcoming. I met people from Italy, Russia, and Denmark. We shared dances, drinks, and I met a friend who was excited as me to witness the Marcel Dettmann five-hour set! My new friend and I were quite amped, as Berlin’s resident Berghain DJ named Marcel Dettmann started his long set. After just returning from Berlin, my newfound love of Berlin and Berlin techno DJs has strengthened quite a bit. I was excited for Dettmann as well as the other Berlin DJs. Marcel Dettmann had an amazing performance and was the highlight of the evening. I traveled alone, but one of the amazing things of this European trip was the awesome people I met. I was lucky to have a friend I met in Berlin at Berghain meet me at Fabric. She introduced me to another one of Berlin’s great DJs Tama Sumo. She ripped the turntables up and we were dancing away to her funky techno jams. One of the last and best performances I witnessed was Ricardo Villalobos. As the wee hours of the morning approached, Villalobos shaked up the crowd for a finale of the evening for my friends and I. However, some party monsters kept going and going. The Fabric 14th Birthday party went all weekend which is something common for Europeans, but not Americans. The Europeans know how to throw a good party by spending it all weekend from Friday until Sunday compared to the usual 2am-4am curfews of most American clubs I’m so familiar with. I made it all the way until 2pm the next day. I find it amazing and comical when I ask, “When do you close?” and the security replies, “not until Sunday”. This party was one of the best parties I’ve been to all my life.